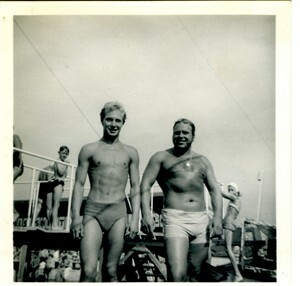 I thought you might be interested in the photos I took of Perry Blake and Roy Walsh at the Great Yarmouth outdoor pool, I am pretty certain that they were taken around 1958. 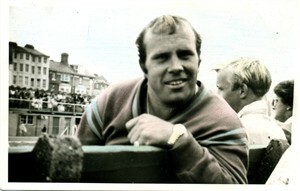 Before Roy turned professional he represented his country at the Melbourne Olympic Games in 1956. 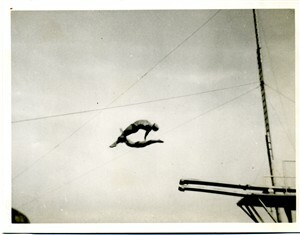 I attended the water follies many times during the 1950s often to watch Perry diving. 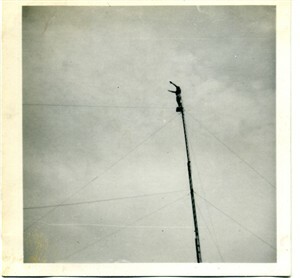 Another attraction during the show was when Perry put on a display of trampolining halfway through the show and would ask volunteers from the spectators to have a go. 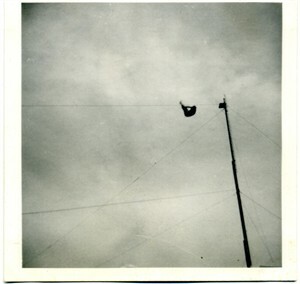 I was often the first one to volunteer as it was the only opportunity I had to get onto a trampoline. I remember one afternoon Perry persuaded me to to try a backward somersault - no problem except I failed to land it properly and ended up trapping his fingers between the metal surround and my backside, no harm done to either party!! Although not present on the occasion he hit his head on the bottom of the pool after diving from the tower into eight feet of water, I understand that he crashed with such force that the long chain he wore around his neck actually broke. 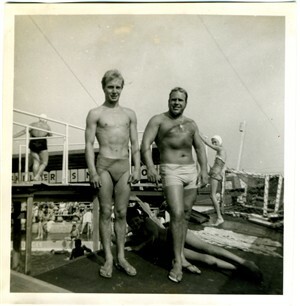 I should mention that I was a member of the Norwich Swan Swimming Club, but spent a great deal of time at the Gt. Yarmouth outdoor pool, frequently to compete in inter-club and County galas both in swimming and diving. Perry came to the Lakenham Baths in Norwich at least once to help several of us with our diving. This page was added by Bridget Belson (Nee Johnson) on 17/07/2013. Hi Paul. I am George Baines' daughter. Pls tell your Dad that I am in constant touch with Sid Brooks. He used to dive in the shows with your Dad and he still lives in Florida. Great to see this item. Dreamland at margate is doing high diving for this season. Great Yarmouth needs that open air pool back.